Crush it, boil it, freeze it - the ToughMax can take it all. Water resistant, crush resistant and temperature resistant, this drive protects against rough-and-tumble use for a variety of lifestyles. Proprietary KyronMax material, used in fighter jets, increases durability without adding weight, creating a uniquely tough USB drive in a slim, stylish design. Optional password protection software makes this drive as tough inside as it is outside, storing data safely and securely. 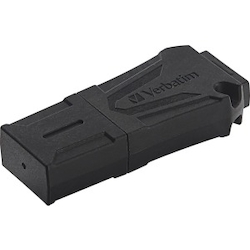 Backed by Verbatims limited lifetime warranty, the ToughMAX is the ultimate in data protection.